Each hero, character, or monster has eight aptitudes: cunning, fight, relate, guile, thrive, touch, labor, and move. Together they represent a kind of demeanor or temperament for the organism. Every action will use two of these aptitudes, adding them up to a set limit. Players then roll a pool of ten-sided dice against that limit, trying to fit the sum of as many dice as possible under it. After rolling, players arrange the resulting dice in secret, making one or multiple stacks. Each stack of dice must add up to be equal to or less than the limit. Sometimes one big stack is all you need; sometimes many smaller stacks are smarter. Enemies will be rolling as well. After both the attacker and defender arrange their stacks of dice in secret, they both reveal them. At this point, stacks of the same size cancel out one to one. Once the duplicate stacks are removed, the remaining stacks ALL take effect, which means both combatants could land an attack in the same turn. Each of the remaining stacks represent one action or attack. Smaller stacks are used for simple tasks – using objects, deploying a special talent, or distracting enemies – while larger stacks are used to attack and deal damage. For example: Fernedaw the Bear, a powerful Edish huntress, is attacking a hunter from another Edish tribe. Their totems have been at war for many generations, and Fernedaw seeks honor among her kin. Fernedaw’s player, Robin, declares: “I lift the slender mace above my head and charge toward the unclean hunter, challenging him with a warcry.” The group decides that her action brings into play Fernedaw’s fight (5) and move (3) aptitudes so her limit is 8. Robin rolls ten dice and begins arranging them into little groups behind a cupped hand. She does not count how many dice rolled less than 8; instead, she makes stacks of dice that add up to 8 or lower. Role-playing the defending hunter, Kelly declares: “The hunter, a descendant of the Mammoth, raises her heavy axe to intercept the whirling mace.” The hunter uses fight (4) and labor (3), representing the size and the bulk of the axe. Because the hunter is less experienced than Fernedaw, Kelly picks up only seven dice and rolls them against a limit of 7. She, too, arranges them into stacks behind her screen. When both players are finished arranging their stacks of dice, they reveal the groupings to one another. 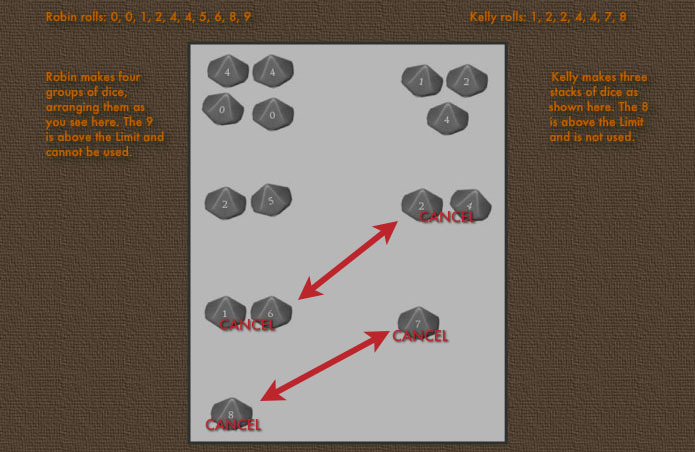 Kelly and Robin then cancel out the duplicate stacks, which removes a group of 1 and a group of 2 from each character. Fernedaw will attack the hunter with the stack of 4 dice and use an ability to help her teammate with the stack of two dice. The Edish hunter, although taking a blow from the mace, also gets to counter with his axe, using the group of three dice to roll damage against Fernedaw. Bouts can get pretty aggressive and players will come up with strategies for handling certain kinds of enemies. Getting away from combat without a scratch becomes quite the feat, and Early Dark pushes for bloody conflicts.